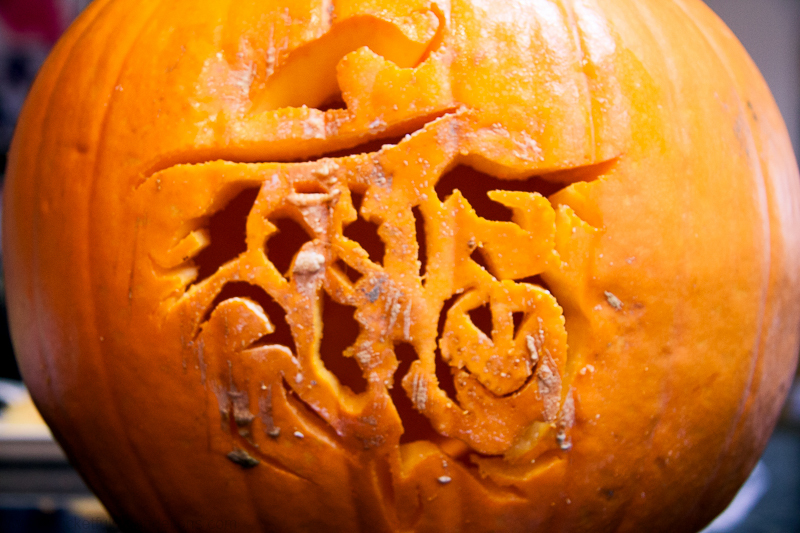 Home Craft	Carve a spooktacular pumpkin this Halloween! I think I might have mentioned once or twice that I go totally batty at Halloween. I love everything about it, the decorating, the fancy dress, the sweeties but especially the pumpkin carving. I used to be a traditional jack-o-lantern kind of girl but over the last few years I’ve unleashed my creative side on our poor unsuspecting pumpkins and carved out haunted houses, witches and all manner of spooky spectres. Every year the pumpkins get loads of attention from trick-or-treaters and last year someone even took a selfie with the Trick-Or-Treat one! And if you have a peek on Pinterest you’ll find many more. 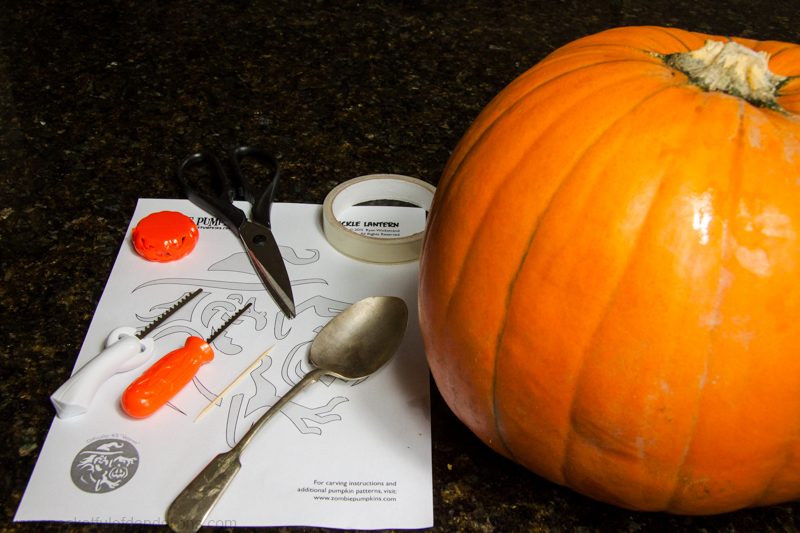 This year I thought I’d put together step-by-step instructions for carving your own spooktacular pumpkin. Be warned it’s seriously addictive and you’ll find yourself outside the supermarket at 9 o’clock at night getting your pumpkin fix. I picked up two on a recent late night shopping trip and when I told Hubs they were ‘for the blog’ he looked at me like I’d gone completely bonkers. Cut an opening at the top of the pumpkin. 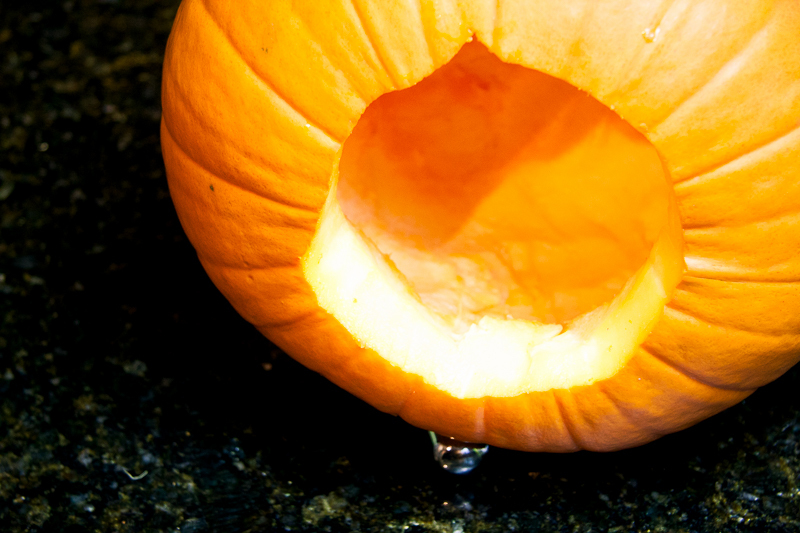 It’s best to cut it at a slight angle so that the lid won’t fall into the pumpkin when it’s been thinned out. Cutting a small triangular notch in the lid will help you to line it back up properly when you’re done. Take a good look at your pumpkin and try to find the flattest face. This is where you’ll put the design. Don’t worry if there are lumps and bumps or scabby bits, it all adds to the ghastliness. Using the metal spoon scrape out the inside of the pumpkin. You need to thin out the part where your design is going to be but don’t make it too thin! An inch thick is about right. 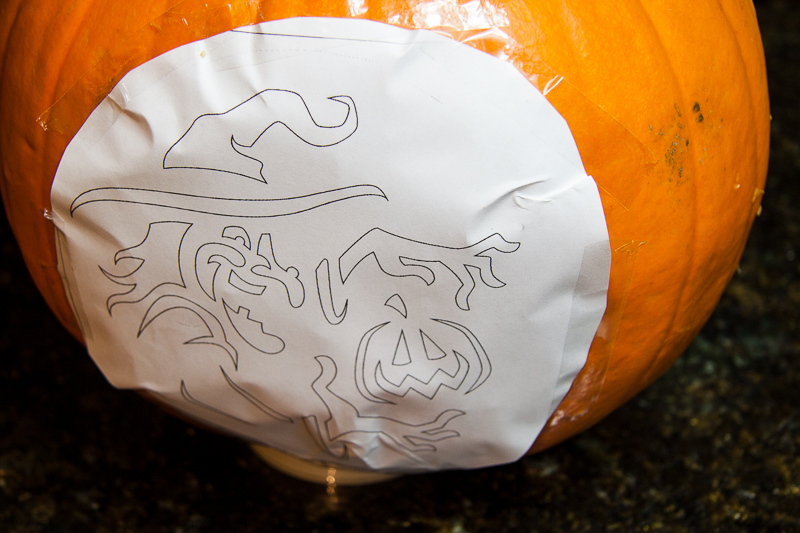 Tape your stencil to the pumpkin. Try and make it as flat as possible – it sometimes helps to snip notches around the outer edge of the paper. Use the cocktail/kebab stick to poke holes around the design. The holes need to be fairly close together so that you can see the outline of the image when the stencil is removed. 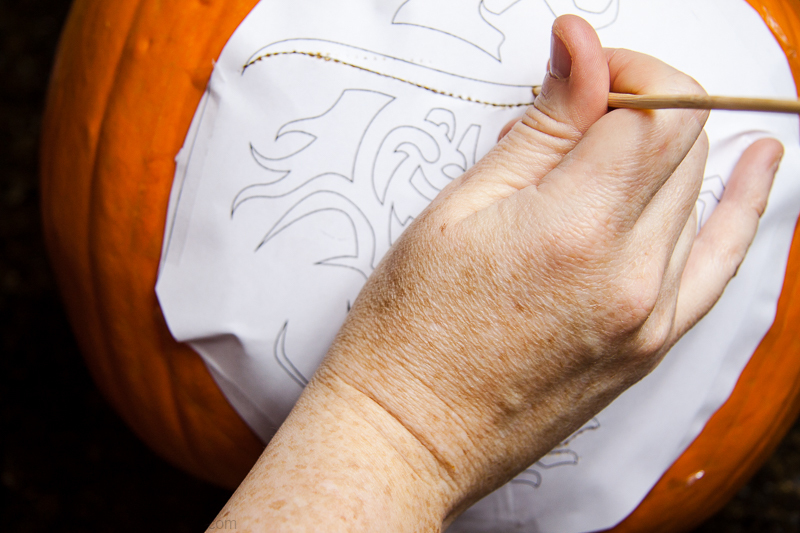 Make sure you’ve outlined the entire stencil before you remove it and don’t throw away the stencil because you’ll need to refer to it while you’re carving. Using your carving saws or paring knife carefully cut out the design following the outlines you poked in step 3. Slow and steady is the name of the game here. Leave the cut out pieces in place until you’ve finished the whole design, this will give the pumpkin stability as you’re cutting. If you’re having trouble seeing the outline rub some cornflour over the holes. When you’ve finished cutting you can carefully push out the cut pieces. You might find your cocktail stick comes in handy for the fiddly bits. 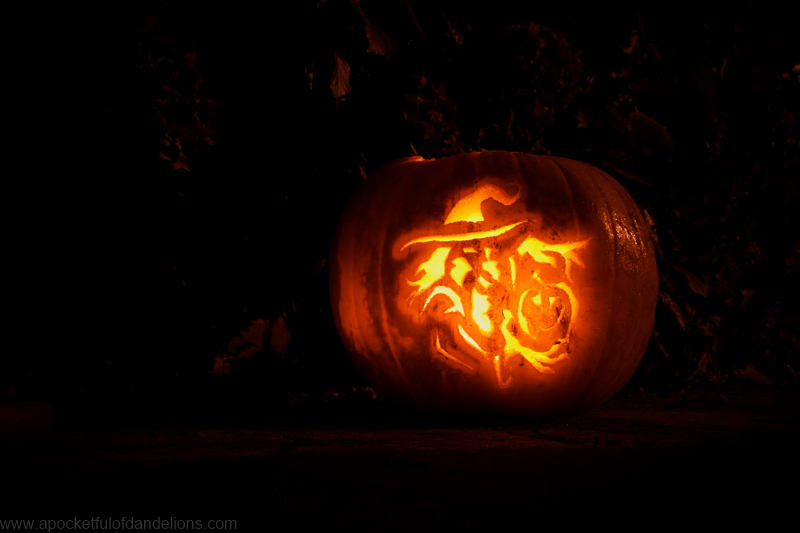 Pop your torch or flameless candle inside the pumpkin, replace the lid and step back to admire your handiwork. I use this set of carving tools but I’ve used a paring knife in the past and had pretty decent results. In my experience the flesh of carving pumpkins from the supermarket isn’t much use for cooking so I pop the scrapings in the compost bin. Carved pumpkins can be kept in the fridge, or somewhere cool and dark, until needed. I like to carve mine a few days before Halloween and then refrigerate them until the big day. You can freeze them but they turn to mush very quickly once they’ve defrosted, so I wouldn’t recommend it. There you have it, 5 steps to a frightfully bewitching pumpkin. Are you going to have a go? I’d love to see your ghoulish creations so don’t forget to tag me with @apocketfulofdandelions on Instagram so that I can have the wits scared out of me. Leaving the bit in place until you’ve finished carving is a genius idea! Your pumpkins look amazing, mine always end up a bit wonky but I think I don’t start with a big enough pumpkin. Is there no end to your talents, Vickie? Your pumpkins are amazing. Without the stencils mine are a bit crap since I have no imagination when it comes to thinking up my own pumpkin designs. Thank heaven for stencils!